How does the PC version of Call of Duty: Modern Warfare 2 compare to the console versions? I spent some time with the game on the Xbox 360 and Steam to find out. The single player experience in the PC and Xbox 360 versions of the game is largely the same, with a few obvious differences. There's the controller layout of course, and being a PC gamer long before I was a console gamer I will always be much more comfortable with a keyboard and trackball mouse than I ever will be with a standard Xbox 360 controller. I could argue that it allows for better accuracy, but it seems to me at least that the hit boxes are skewed more towards console gamers in the PC version, meaning that accuracy isn't as important as it is in more PC-centric titles. The graphics seem a tad bit sharper on my PC, but that could just as well be a factor of the clarity of my monitors and the fact that my current gaming rig - an Intel Core i7 2.6GHz with 6GB of RAM and dual GeForce GTX 275's - is a bit beefier than what I'm used to playing on. It really isn't a huge difference, however, so I wouldn't call either side the winning one graphically. Basically, as far as single player is concerned, the games are relatively similar. Which brings us to the multiplayer side of things. The PC version of Modern Warfare 2 has of course gotten a great deal of flack from the PC community for imposing console player-limits and removing the ability to create dedicated servers for online multiplayer, a feature that's been standard in previous games in the series. This having been said, the PC version loses a point to the Xbox 360 as far as local multiplayer options go, with the ability to network multiple 360 consoles together via System Link. 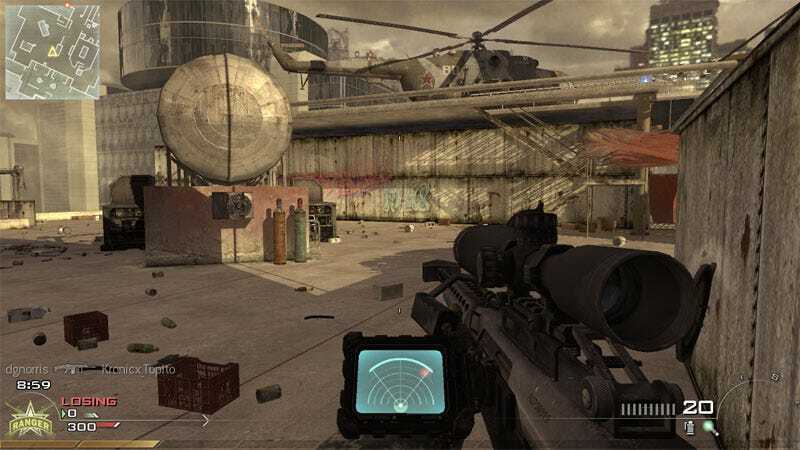 There are no LAN options for Modern Warfare 2, and of course no split-screen multiplayer either, so the console is coming out on top so far. Aside from the LAN options and a few smaller details, such as PC text chat, that's where the differences end, which I suppose is why many PC gamers are incensed. The PC version features the same, network-controlled matchmaking system as the Xbox 360 version, without any of the advanced controls that PC players are used to. You can still set up a private game and tweak options like number of lives and friendly-fire, but for the most part it's click, join, and go. As for reports of the PC version being open to cheaters and hackers, I've yet to see an instance of obvious cheating in my brief time on Steam, though in all fairness I do spend an awful lot of time dying. As a PC gamer myself, I find the lack of dedicated servers to be frustrating, but then I am also a console gamer, so this is the sort of thing I've gotten used to over the past few years. When all is said and done, it's a matter of personal perception whether the system is inferior or not. Should you feel slighted for getting what is essentially the same thing on both platforms? That's completely up to you. Keep in mind that I'm not the most dedicated or skilled Modern Warfare 2 player by a long shot, and your personal experiences with the two different versions may vary. If they do, they by all means, tell us.